Immigration reform in the United States is imminent. If the proposals on the table haven’t impacted your business yet, they will when law is passed. Forewarned is forearmed: “To be prepared is half the victory.” The Gringos Guide to Immigration Reform for Employers was written to do just that-prepare employers for new requirements in compliance, documentation and employer-employee relations. This book will teach you how to counteract undue union pressure, revise or create company policies and procedures, comply with new Form I-9 changes, manage healthcare benefits under ObamaCare, and more, including essential bonus material helpful for others who need to be preparing for changes now! 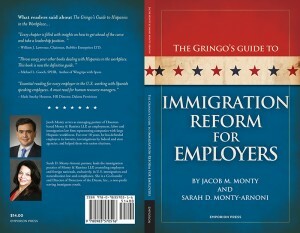 Authors Jacob M. Monty and Sarah D. Monty-Arnoni bring many years of experience as legal counsel to both employers and foreign nationals to the pages of this book. 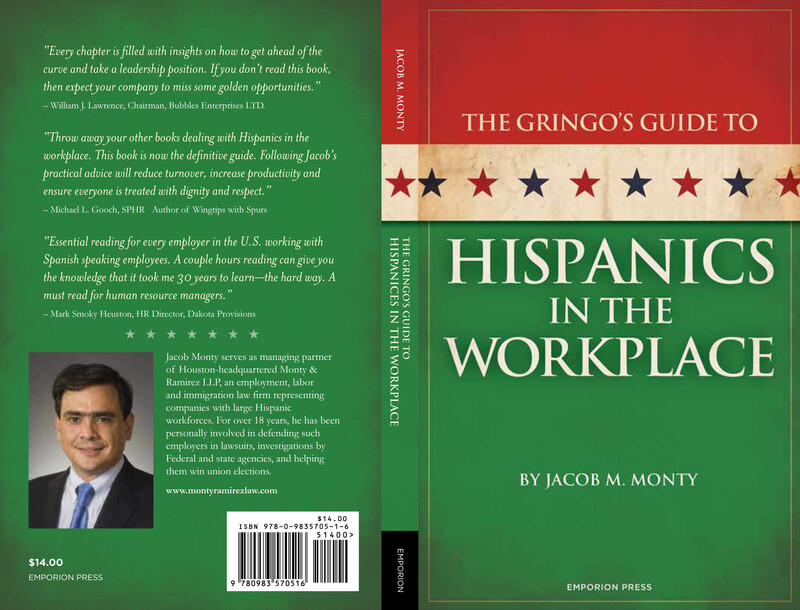 U.S. employers of all sizes with Hispanic workforces will find The Gringo’s Guide an essential handbook. 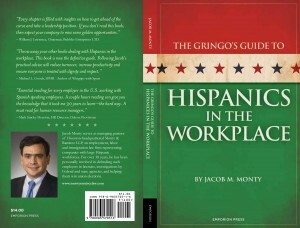 Monty, a Mexican American attorney based in Houston, Texas, delivers a practical and insightful, step by step guide to understanding the cultural nuances of Latinos such as humor, machismo, holidays, and family traditions, all of which factor into the successful integration of Hispanic workforces. In plain English, he presents the issues employers and management need to know about immigration, unionization, pay, vacation, and more—including the surprising details of Monty’s own undercover experience as an illegal immigrant worker. Jacob Monty serves as managing partner of Houston-headquartered Monty & Ramirez LLP, an employment, labor and immigration law firm focused on representing companies with large Hispanic workforces. He has worked for companies with large Hispanic workforces for 18 years, defending them in lawsuits, investigations by Federal and state agencies, and helping them win union elections. He is passionate about defending his clients and also about the Hispanic worker. His clients range from family-owned enterprises to publicly traded companies. He brings a wealth of real-world knowledge to the reader. Professional exploits include defending employers involved in some of the largest raids and investigations by immigration customs and enforcement, and successfully winning for companies some of the largest elections. Jacob is also a vigorous Latino advocate. His expertise on Latinos has been sought after by the Bush White House and many political campaigns, both Republican and Democrat. In 2001 he was offered the then INS Commissioner position by President George W. Bush, but chose to stay in private practice. He also organized the first Latino Safety Summit in Charlotte, North Carolina, in 2004. Jacob Monty is a founder and director of the non-profit Protectors of the Dream, an organization committed to helping young immigrants achieve Deferred Action Status. The employer mandate of the Affordable Care Act will be fully implemented by January 1, 2015. But right now, it’s causing concern and anxiety for many business owners who say they don’t understand how the new law works, or how they’re going to pay for it. 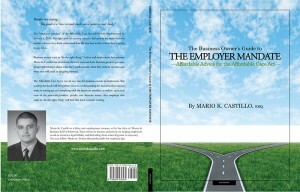 Business owners want to “do the right thing.” Author and employment law attorney Mario K. Castillo has written an objective nuts and bolts business guide to give employers information about what they need to know, what they need to do now, and what they will need to do going forward. The Affordable Care Act is not an easy law for business owners to implement. But reading this book will bring them closer to understanding the decisions they need to make in setting up and complying with the employer mandate, as well as, a practical view of the potential penalties, pitfalls, and alternate routes. While the mandate has been delayed, it has not been cancelled. Business owners need to take advantage of the extra time to make sure they get it right in January 2015.